Collecting a decade of Rafael Navarro commissions, re-scanned and presented uncropped and unretouched for the first time anywhere, with a wide array of rough drafts, ringside sketch reference, exclusive new portraits of Santo, Blue Demon and Mil Mascaras and more. Both artists and publisher provide DVD-style ‘commentary’ throughout, highlighting the creative process. Particularly interesting is the evolution of the cover and illos for Hoodtown, and the trials of creating a cover for this very sketchbook. 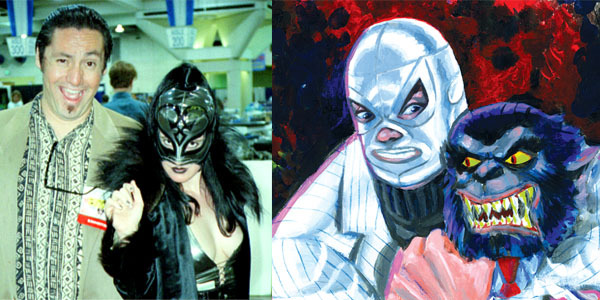 A must for Sonambulo completists and a valuable read for artists inspired by lucha libre.